As expected, the X3 M looks like a more aggressive version of the latest X3. 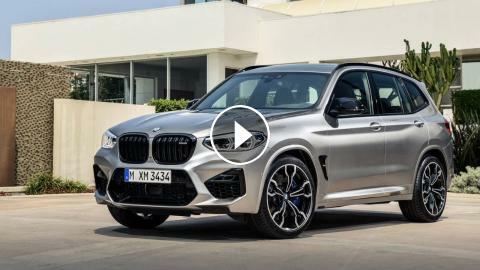 Stepping in the footsteps of its larger sibling, the X5 M, the X3 M boasts a blacked out grille, larger vents in the front bumper, and standard LED headlamps. While the side vents are still similar to the standard X3, the center outlet is downright impressive. Not only larger in all directions, it also sports an aggressive hexagonal shape with sharp corners and a really wide center section. Go with the Competition upgrade and the entire grille becomes gloss-black for a more menacing look. Onto the sides, we can see how the X3 M sits a tad lower than the regular model and features a few extras, like black window trim and mirror caps and 20-inch wheels in a cool, twin-spoke design. The Competition model also features black M gills on the front fenders and larger, 21-inch wheels finished in polished black.